The two main options of getting from Malelane to Skukuza are on the tar road (H3) via Afsaal or along the dust road (S114) via Biyamati Weir and Renosterkoppies. Both roads have interesting loop roads and are good for both birding and game-viewing. The tar road from Malelane to Afsaal (H3) passes the landmark Thlalabye Hill (630m), crosses the Matjulu River and climbs along the edge of the south-western foothills into the rolling woodlands of south-central Kruger. The first part of the drive is often good for raptor sightings early in the day. They often perch in the tall, woodland trees waiting for the heat of the day to create thermal currents to help them take off. Summer regulars are the Lesser Spotted Eagles, while Tawny Eagle, Bateleur and African Hawk-Eagle are resident. 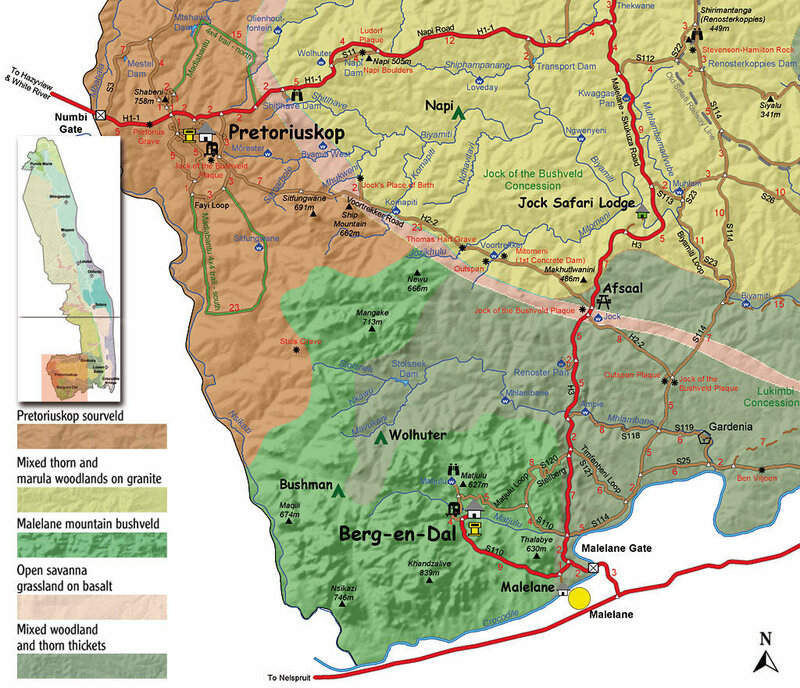 The road drops from the Malelane mountain bushveld into the mixed Knob-thorn and bushwillow woodlands of the Mlambane catchment are where the landscape opens up for sightings of grassland savanna birds. These are favoured summer nesting grounds for the Yellow-billed Kite and Wahlberg's Eagle. Wahlberg's nests are conspicuous in Knob-thorn and Ebony Jackal-berry trees along dry watercourses. Their nests appear flimsy because of their use of thin sticks which are gathered together in tree forks. The H3 is a godd rhino-spotting route. On overcast days there is often a good chance of seeing the Pearl-spotted Owlet, which usually announces its presence with a high pitched call when it is often answered by a mate. In summer, the Jacobin Cuckoo is often visible in the bush along the road. The grassland around Renoster Pan off the H3 along the Mlambane creek is prone to overgrazing. When the grass is grazed short and burnt, small flocks of Temminck's Courser may be seen here, walking around the veld looking for insects. It occasionally uses its bill to dig for termites, and also eats grasshoppers and beetles.